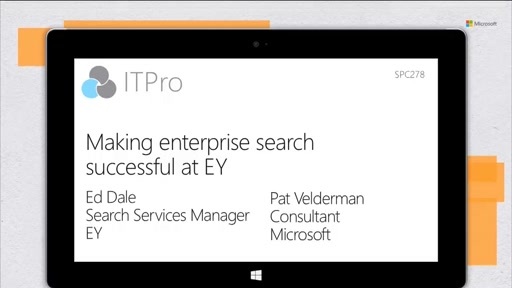 In this case study, Ed Dale discusses the SharePoint Server 2013 search program at EY, providing real-world examples from the EY environment for how to improve your own search environment. The presentation explores various techniques, including optimization of content, user training, search log analysis, relevancy tuning, and voice of the customer initiatives—all of which positively impacted the adoption of SharePoint at EY. Ed will use examples from the enterprise search management program at EY which supports 170,000 users spanning multiple business units, geographies and languages. Informative session! E&Y shows that it CAN be done!